I asked twitter for some ideas for this week’s craft as I was lacking in time and inspiration. Felt-queen Laura (aka @bugsandfishes) pointed out that it was National Doodle Day so I needed no excuse to go lo-tech and dig out the pens and paper. 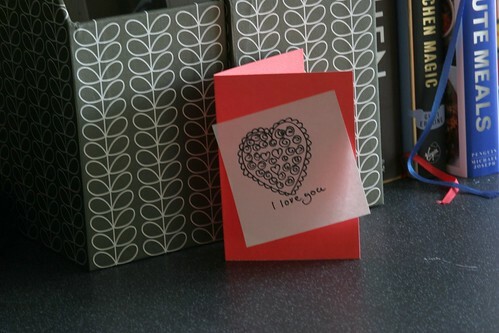 I also doodled on a few post-it notes and with it being Valentine’s weekend (when did Valentine’s day turn into a whole weekend I wonder) I drew some romantic notes and turned one into the quickest card ever (perfect if you’ve just woken up today and realised you’ve forgotten something). 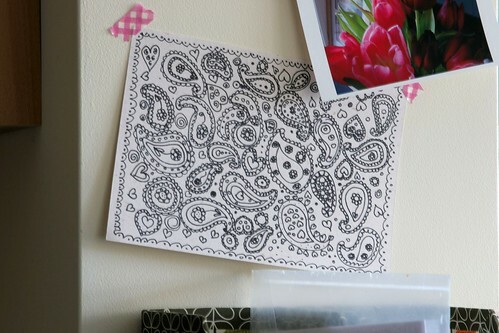 You could lots of crafty things with doodles. Apart from turning them into cards you could use them as a basis for an embroidery design, use paints to colour in the shapes, turn them into screens for printing and… what else? wow, you are good at doodling! I can’t draw paisley motifs like that!